As an aside, $M\;$ solves Heron's problem for $C,\,D\;$ and the line $AB.\;$ It is, therefore, uniquely defined for given $C\;$ and $D,\;$ regardless whether or not angles $BMC\;$ and $AMD\;$ have been specified beyond being equal. We have $CM\parallel AP\;$ and $DM\parallel BP\;$ so that triangles $CNP\;$ and $PQD\;$ are similar. 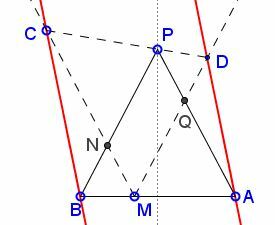 In addition, $BN=MN=PQ\;$ and $AQ=MQ=NP.\;$ THe quadrilateral $MNPQ\;$ is a parallelogram. In the hexagon $BPADMC\;$ whose vertices alternate on two lines $AB\;$ nd $CD,\;$ two pairs of sides are parallel by the construction, meaning their intersections lie on the line at infinity. By Pappus' theorem so does the intersection of the third pair of sides. The problem just discussed is the basis for a proof (Proof 2) of an engaging problem invented by Miguel Ochoa Sanchez. Proof 2 is by Grégoire Nicollier.